In front, from left, are Elizabeth Long (business teacher), Jake Cowan, Tate Cowan and Jared Krugman. In the back row are Devon DeWitt, Clayton Hicks and Jeff Phillips (business teacher). Not pictured is Mercedes Winkleman. These students and teachers will be attending the International DECA Conference in Atlanta. 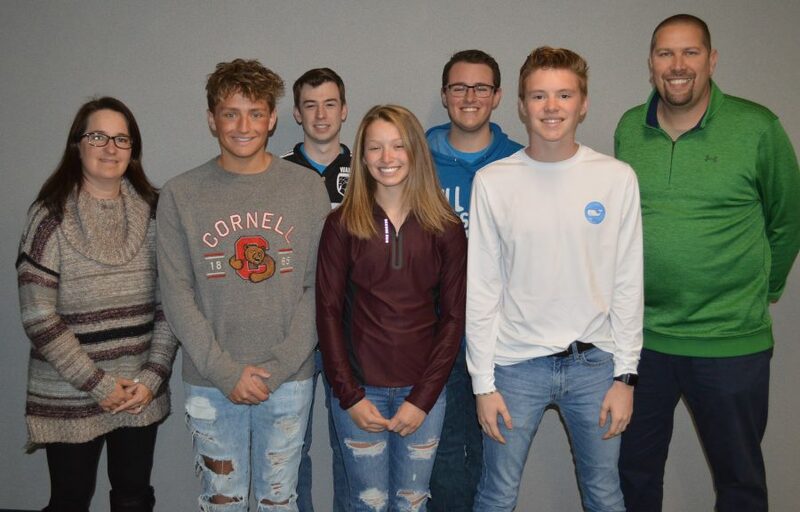 SYRACUSE — A group of Wawasee High School students will be heading south away from the more winter like conditions in northern Indiana. Tate Cowan, Clayton Hicks, Jake Cowan, Jared Krugman, Devon DeWitt and Mercedes Winkleman qualified to attend the International DECA Conference April 20-25 in Atlanta. DECA is an international organization of high school and college students focused on business, marketing and more. Tate Cowan and Hicks qualified for the international conference through the state competition March 4-6 in Indianapolis. Tate, a freshman, will compete in principles in business administration and marketing, while Hicks, a senior and in his first year with DECA, will compete in automotive service marketing. Both students will take tests and also compete in role playing situations. They will be given 20 minutes to prepare for those situations and then 10 minutes to speak with a judge. The other four Wawasee students were chosen for the leadership academies at the international conference. Jake Cowan, a senior, and DeWitt, also a senior, were chosen for the college preparatory academy. Winkleman, a junior, and Krugman, also a junior, were chosen for the DECA Leadership Academy. Winkleman, though, will be unable to attend. Those selected for leadership academies will also do some role playing in order to prepare them for leadership positions. This is the second year in a row Wawasee has had students qualify for the international conference. Business teachers Jeff Phillips and Elizabeth Long wish to thank those who have sponsored or helped DECA in any way.